Today was day two of our “sprint” from Jackson Hole to England. We have six people on the plane and five of us begin a one week cycling trip in the Lakes District and Yorkshire Dales area of England on the 14th. We awoke in Iqaluit to an absolutely stunningly beautiful morning. Clear skies, light winds, and cool air. The plane practically leapt off runway 16 at Iqaluit as we headed east across Greenland for a fuel stop at Keflavik, Iceland. This part of the trip included extended operations over cold water and thus I wore a fancy “constant wear” (i.e., fairly comfortable) immersion suit as PIC. The theory is in a real emergency; I would need to stay at my post working the problem. For everyone else in the plane, we have “Gumby” type immersion suits. We also carry a top-quality Winslow covered life raft, a Doug Ritter aviator’s large survival kit (23 lbs), and multiple personal locator beacons (PLBs). My wife and I also have taken a one-day aircraft water evacuation course and brief everyone on the plane on what we learned in that course. With regard to passengers, I require everyone practice donning their immersion suits in the plane, but do not require them to wear all the time. During practice, most folks can don the suit in about two minutes with a little practice…three or four minutes at most. This would not be a practice I would recommended in a Cirrus or a smaller plane flying at lower altitudes as it would be very difficult, if not impossible, to don an immersion suit in the confined space of a four seat plane. Moreover, if a ditching did become required, flying at lower altitudes in a plane with a steep glide path does not allow much time to get ready. Thus, if doing a trip like this in a Cirrus or similar plane, I’d highly recommend everyone wearing an immersion suit for the full time over water. With the PC12, the situation is very different. First, the cabin in much larger and thus it is fairly easy to don the suit in the plane (except for the pilot that needs to stay at the controls). Second, from our cruising altitude glide time to sea level is almost 35 minutes. Even an emergency descent allows plenty of time to don the suit. However, all this depends on training…everyone needs to have practiced getting the suit on beforehand. A solid undercast developed and we did not see the west coast of Greenland or much of the icecap, but fortunately the sky cleared at we reached the east coast of Greenland and we were treated to some spectacular views (photos do not do it justice). A shot of over Kulusuk...there is an Iceland Radio VHF and HF communication outlet down there somewhere at an old DEW line base (DYE-4 to be exact). It was spectuclar out the windows, but not so much in the photo. Note the icebergs. The photo above was almost directly above Kulusuk (BGKK) which we had considered using as our fuel stop instead of Keflavik just for a change of scenery. It is a 3900 FT gravel runway, but that is fine for our plane. The only instrument approach is an NDB, but we are ADF equipped so that would work too. In the end, we decided Keflavik was the more conservative choice, but flying over Kulusuk I was sorely tempted to make a detour and land. Maybe next trip Kulusuk can be our fuel stop. The weather was good in Keflavik. The winds were even fairly calm. The only complication was one of their two runways and several taxiways were closed thus funneling all arriving and departing traffic to runway 11 and requiring a lot of back-taxi on the runway. Keflavik is a fairly busy international airport and this situation got our attention once we landed. On departure, they had us back taxing head-on with a A321 on about a one mile final…we were motivated to taxi quickly! One unusual feature of Iceland ATC is they will not accept international flight plans except via a local handler. Not sure why as they seem to have fairly modern systems, but every time I have been through there they will not accept my flight plan electronically from ARINC. I have to print it out and then then handler faxes it to them. In this case, the handler said he was filing our flight plane while we were refueling. We got our clearance after a few minutes of delay. After a fairly quick turn at Keflavik, we departed for Newcastle with a 3+26 estimated time enroute. After climbing through an overcast layer we had good VMC smooth air (we did make one small deviation to stay VMC) at FL280 until the descent. Our routing was fairly direct to the boundary with Scottish Control airspace and we had good VHF communications all the way. Scottish Control seemed pretty surprised when we showed-up at their boundary, so I am not exactly sure if the handler in Keflavik filed the full fight plan for us or just the oceanic piece. In any event, after a bit of conversation about our destination we got a pretty direct clearance to Newcastle. As we started our descent into Newcastle, we entered uncontrolled airspace (Class G) at FL155 (15,500 FT). For reasons I do not understand, the UK has vast amounts of uncontrolled airspace where all ATC can provide is a “de-confliction service” – sort of like VFR flight following except it applies to IFR as well. For Americans used to being “in the system” most all the time when in IMC, it is a bit spooky to be steaming through 15,000 FT of uncontrolled airspace in IMC. But, it is the British way. We manage to break-out of the overcast around at 3,000 FT without being hit by another airplane. 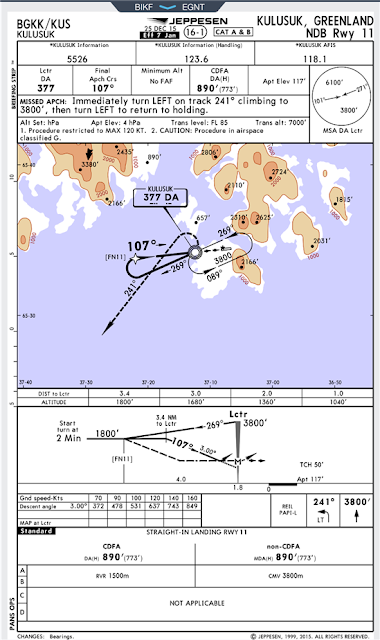 We were cleared for the NDB ILS DME RWY 25 approach which we had briefed hours before. It was good VMC and we had the airport in sight, but continued to shoot the approach. We arrived at Newcastle and the handler (who I am pretty certain had had a few pints already) greeted us. The "crew" ( the three pilots) had no immigration or customs review at all. But, the three passengers were driven over to the main terminal while we secured the plane for UK Border Force clearance. Within 30 minutes of landing we were in a van arranged by Universal Aviation and headed to our hotel. The next week was wonderful, but totally focused on cycling so I won't cover it here. I'll just say we had six consecutive sunny days in northern England (Lake District and Yorkshire Dales) which it pretty darn lucky. We will pick-up the trip again on the flight from Newcastle to the Faroe Islands. Leaving Canada, we saw glaciers and fog-filled valleys...flying over Greenland was (again) mostly cloud covered, but we got a few glimpses of the ice cap, rippled by dark shadows of passing clouds. To keep ourselves entertained, we practiced getting into our immersion suits.